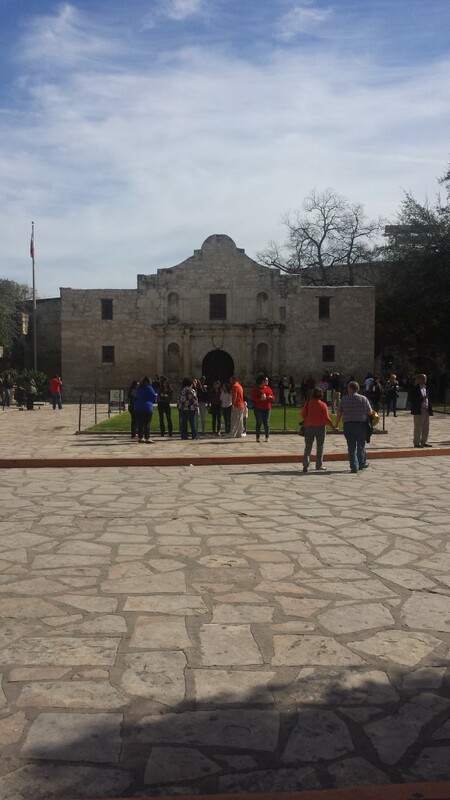 I am probably one of the few people who was like, “Huh, the Alamo is bigger than I thought.” It was bigger than most people make it sound. It was a unique experience too. On a Sunday afternoon in January there are no lines, We walked up and in with no problems. Inside the Alamo was an old firearms exhibit that added to the fun. The exhibit ranged from the musket to the repeating pistol to modern (1900) revolvers with relatively modern metal cartridge ammunition (the bullet that we use today)–this exhibit is something that is not normally there and added to the experience. A few things we found interesting about the Alamo – there are names carved in various places around the rooms. Josh asked one of the guides if some of it was graffiti or if it was a part of it all. His response was “Yes, it’s all graffiti from the army in the 1800’a.” He even pointed out a general or captain that had carved his initials on one of the walls. Another interesting thing from the Alamo is the recovery process of trying to restore it, or at least recover part of it to pre-Army usage. Basically when the Army took over the Mission they covered all the walls with white plaster or “White Wash”. As the white wash deteriorated and/or was removed it began to expose art stone work and decor that pre-dates the colonization of Texas. They are simple but interesting. Pictures you ask? They don’t allow the use of any electronics in the Alamo let alone cameras. If you take out your phone you are kindly asked to put it away or step outside. I think we knew this before we went but were surprised when we walked in at how strict they were. The grounds of the Alamo are filled with trees and vegetation, a library, gift shop, and another section that we never made it too. I’m not even sure if you can go into them, but the long narrow building on the edges of the courtyards. We took come pictures here. Also, this is the first outing that our sons had cameras so I am putting some of their pictures at the end so you can see the trip from their perspective. Another unexpected aspect of the Alamo is the tourist trap that surrounds it. There is a small mall and a section of entertainment houses similar to what you find in Vegas, Hollywood, and Branson, There is a wax museum, a Ripley’s Believe-It-or-Not, some 3D ride and more touristy places. I guess since the Alamo is free someone needs to take your money. The river walk was also a pleasant surprise. We have been to several river walks and expected it to similar, yet grander. We were wrong. It was unlike any river walk we have ever seen and it was not about being grandiose. It was small, peaceful, and serene. If you can’t tell, I have a thing for places like this and from the responses we got on Facebook it seems many share these sentiments. It’s one of those places that you have to experience to understand and appreciate it – from the narrow walkways to the unique restraints and pubs along the way. I am told it looks very different in the winter than in the summer. I imagine it’s much more hot in the summer too. The section is a bit shorter than I expected. To walk all of it you can expect a 2 to 3 mile trek. The section that is most developed is around a half a mile. There are plenty of shops and restaurants to keep you busy too, be it a night out or an afternoon stroll. At the end of the day we sat for a bit as the sun began to set and watched the lights come on. The place transformed from day life to the start of night life. After dusk the area become even more interesting with new light effects and different kind of bustle. We even ran into some familiar faces from Kansas, at night, in the dark along the river walk. Small world. With that we called it a night. It was getting late and things were closing. We wandered back to the truck and hit the road. On the way home we made another stop. Unrelated to San Antonio, but very much related to our travels through Texas and the south; we had our first stop at a buc-ee’s. A massive Buc-ee’s outside of San Antonio. It was about the size of a Walmart with a ton of fuel pumps – think two sets of gas pumps deep that run the entire length of the storefront. To date it is the biggest gas station we have ever seen. Zander even took some pictures. If you ever pass a massive Buc-ee’s and you’re not in a hurry, it’s a must stop. I guess you could be in a hurry but then you can’t walk around and take in the pure redneck.